What vitamin influences your mood, energy level, brain function, heart, skin, hair, and digestion? That would be vitamin B12. There’s a lot of interest around this essential vitamin, and many people claim it helps prevent aging. Let’s look at vitamin B12 and the truth behind the myth. Vitamin B12 is a vitamin that can dissolve in water (“water-soluble”). This vitamin is naturally present in some foods and can also be taken as a dietary supplement or as a prescription. Your body does not generate B12 on its own, so you must get it in food or supplement form. Vitamin B12 exists in different forms, and each contains the mineral cobalt. Methylcobalamin and 5-deoxyadenosylcobalamin are the types of B12 vitamins that work in your metabolism. Vitamin B12 is essential for very important body processes like normal red blood cell formation, nerve function, and DNA synthesis. In food, vitamin B12 is usually bound to protein. If you take vitamin B12 in supplement form, it is free from protein binding. What Happens With Vitamin B12 Deficiency? Vitamin B12 deficiency could be caused by not getting enough of the vitamin in your diet. Another cause of vitamin B12 deficiency can be due to an illness called pernicious anemia, which is an autoimmune disease. Pernicious anemia leads to problems in the wall of your stomach, and the result is that your intestines can’t absorb the vitamin. This is due to a lack of a substance called intrinsic factor. This means that even if you eat plenty of vitamin B12-rich foods and take supplements, you will still have a vitamin B12 deficiency. People with pernicious anemia usually need to be treated with vitamin B12 injections. 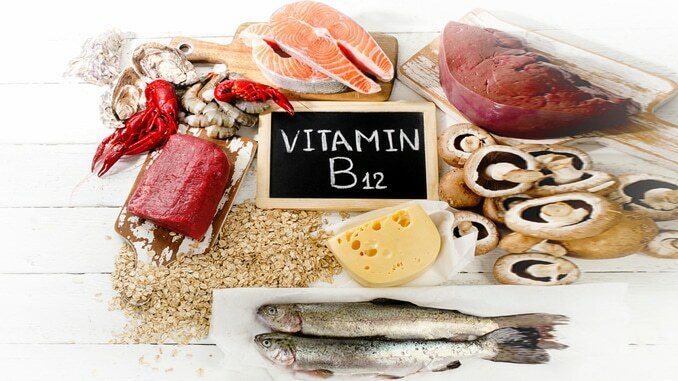 The National Institute of Health’s (NIH) Office of Dietary Supplements states that up to 15 percent of people in the United States may be deficient in vitamin B12. Research published in the American Journal of Clinical Nutrition stated that 39 percent of people might be deficient in vitamin B12. All of these factors may affect the lining of your stomach or intestines which could block vitamin B12 absorption. What About Vitamin B12 & Aging? As you can see from the list of symptoms above, vitamin B12 has a lot to do with processes commonly associated with aging. Take cognitive function for instance. If you are deficient in vitamin B12, you could experience trouble with remembering things, such as directions to get somewhere. In the worst case scenario, you could even develop an Alzheimer’s disease-like dementia. Therefore, adequate vitamin B12 intake plays a protective role in brain function. If we look at the other symptoms associated with vitamin B12 deficiency ― such as fatigue, constipation or depression ― we can see how these are sometimes associated with aging. Instead, could it be a simple vitamin deficiency instead? Vitamin B12 may play a vital role in the prevention of heart disease. Studies show that when levels of homocysteine are high in your blood, your chance of heart attack increases. When vitamin B12 is deficient, homocysteine levels rise. Although the theory makes sense, so far studies have failed to prove vitamin B12 decreases the risk of heart attack. The Heart Outcomes Prevention Evaluation (HOPE) 2 trial included 5,522 patients older than 54 years with vascular disease or diabetes, and they were given 2.5 milligrams of folic acid, 50 milligrams of vitamin B6 and 1 milligram of vitamin B12 for an average of five years. This treatment reduced homocysteine levels and the risk of stroke, but it did not reduce the risk of major cardiovascular events. The initial steps for diagnosing vitamin B12 deficiency are an interview and exam by your doctor. Since the symptoms of vitamin B12 deficiency are nonspecific, it’s important to rule out other causes. For instance, a thyroid problem or diabetes might cause similar symptoms. There is also a blood test that can measure your blood vitamin B12 levels. However, some of these tests are notoriously inaccurate. If you remember, low vitamin B12 levels can lead to an increase in homocysteine levels. This means that more detailed testing for vitamin B12 deficiency often includes a simultaneous analysis of homocysteine levels. Now as we’ve seen in other articles, the quality of these sources varies. For example, there’s a that pasteurization removes essential nutrients from milk. In fact, raw milk (unpasteurized) may be much healthier for you. Also, beef that is grass-fed and organic is much healthier for you than meat full of antibiotics and added hormones. Brain health: Vitamin B12 helps keep your neurons functioning optimally. 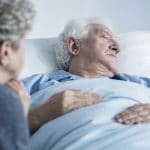 This means B12 may prevent Alzheimer’s. Due to its ability to lower homocysteine, vitamin B12 might also lower your risk of stroke. Mood: Low vitamin B12 levels have been associated with depression. Even general fatigue might be due to a lack of vitamin B12. Some evidence suggests that vitamin B12 may also help you cope with anxiety and stress. Energy: Vitamin B12 plays a key role in the conversion of carbohydrates into glucose which you need for energy. Also, if your nervous system is not working normally, it could lead to fatigue. Skin & hair: As vitamin B12 plays a role in cell production, it may promote more supple skin and healthier hair. Vitamin B12 deficiency may speed up the skin and hair aging process. Heart & circulation: Although the studies are not conclusive, vitamin B12 lowers the level of an important heart attack risk marker (homocysteine). Digestion: Vitamin B12 plays a critical role in your metabolism and food breakdown in your digestive tract. Pregnancy: By interacting with folate, vitamin B12 may play a role in the prevention of neural tube defects in newborns. Does Vitamin B12 Prevent or Cause Cancer? Increased intake of vitamin B12 may lower the risks of some cancers, such as of the breast and cervix. However, long-term intake of vitamin B12 supplements may be associated with an increased risk of lung cancer, especially in male smokers. Dietary intake of folate and vitamin B12 during pregnancy is associated with a lower risk for acute lymphoblastic leukemia in children. Further research regarding the effect of vitamin B12 on cancer is ongoing. Should You Take a Vitamin B12 Supplement? Before you take additional vitamin B12 beyond what’s in your diet, you should consult with your doctor. 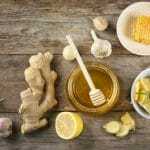 If you have symptoms as described in this article ― with no other obvious cause ― you might ask for more sophisticated testing of your vitamin B12 levels. If you are found to be vitamin B12 deficient, the next step would be to determine if you absorb the vitamin properly in your digestion. Poor absorption would require vitamin B12 injections to correct the deficiency. 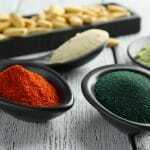 Between your diet and a once-daily supplement, you can reach these recommendations easily. If you have diagnosed with vitamin B12 deficiency though, your doctor will recommend your daily requirement to replenish your vitamin B12 stores. Vitamin B12: A Wonder Drug? There is no such thing as a miracle vitamin that will keep you young forever. Vitamin B12 helps keep your body in good health, but it won’t make you superhuman. Still, you can maximize your health if you pay attention to symptoms and follow the best nutritional guidelines.